Hello and welcome to FutureTrainers.com! You probably already know this site is dedicated to helping you achieve your career goals as a personal trainer. Whether you’re completely new to training and want to find the best certifications, or are looking to expand your client base by learning advanced marketing strategies, you’re in the right place. The reason I started Future Trainers is simple. There are an increasing number of personal training certifications, courses and seminars available, along with various continuing education units. This can make it confusing for personal trainers (new or experienced) to know which is the best to choose for their goals. This is made harder by the fact that there is no obvious “best” certification – there are several that provide a legitimate qualifications. Which certifications are recognised by popular gyms? Which are the best when trying to get clients? And are there any you should avoid? Despite the confusing certification landscape, many people want to become personal trainers. It’s easy to see why – personal training can be a fun career that lets you use your passion for fitness on a daily basis. Depending on your goals, becoming a personal trainer can also provide more freedom, a great source of income and plenty of scope for career progression. To help you reach your goals, I review many of the most popular personal trainer certifications. Each review is written after conducting thorough online research into the content and quality of a certification. The site also provides tips for managing clients, designing advertising, getting insured, building your client base and everything else you need to know about being a personal trainer. My name is Richard Spencer, and I’m a 37 year-old guy from Seattle. Before I write a bit more about me, I want to thank you for visiting FutureTrainers.com. I hope it helps you with your personal training career! I’ve always loved sports. In my youth, I would spend every evening playing with friends or taking part with local sports teams – it was a massive part of my life. Unfortunately, at around the age of 20 I started to develop joint and tendon pain. This started in my knees, but quickly spread to the achilles, hip flexors, shoulders, elbows and even fingers. After endless physiotherapy and several surgical procedures, the pain had reduced to manageable levels – although no-one had found the underlying cause. I had no choice but to give up most sports though, as the unpredictable movement was too harsh on my joints. The good news was that I could still go to the gym. While contact sports or racket games were off the table, weight lifting and cardio machines were fine. I found the constant striving to improve my performance provided the same enjoyment as traditional sports, with the added bonus of developing a body I could be proud of. 10 years later and I’m just as obsessed with fitness and nutrition as ever. 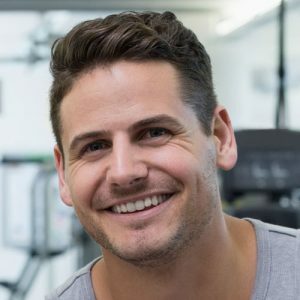 By building FutureTrainers.com, I want to help people have an amazing career as a personal trainer, as there is nothing more rewarding than helping other people become fitter and happier.